This book is sarcastic and irreverent, but it is so sensible and brilliant! 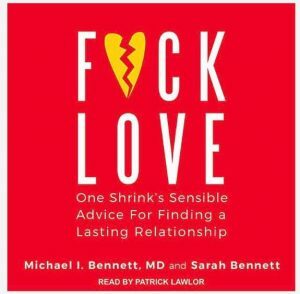 F*ck Love: One Shrink’s Sensible Advice for Finding a Lasting Relationship by Michael Bennett and Sarah Bennett. I listened on Audible over the course of two days, and when I was done with all the snarky quizzes and blunt advice, I felt GREAT! And in this modern day world in which we actually get to choose our partners based on love and not our father’s arrangement of our marriages, or our society’s rules about who we can even be interested in, it’s important to still be sensible about who we choose to build a life with. That makes sense in theory, and I probably have said that aloud to myself and my friends and truly thought I believed it, but to be honest, I needed to HEAR these eight chapters by Michael Bennett and his daughter, Sarah, to have it sink in more. Love is SO SEDUCTIVE! And when I have fallen in love with someone, I have always thought somewhere deep inside me that it should be enough, or work out in some lasting way if I just loved the other person (and myself) enough. I had two (maybe three) past relationships that did not work out that have, despite time and distance, remained painful — wrapped up in heart-ache and confusion. Those were the ones where I DEEPLY LOVED THEM! Like, really REALLY loved them. I didn’t end the relationship hating them. I loved them, and it didn’t work out, and it was hard to reconcile that. If I love you ENOUGH, it has to work between us, right? Romances are wonderful experiences of love, but also, would it be helpful to treat them a bit more like business deals? YES! I’d say so. But I haven’t always known how to do that. Will we actually work well together over the years, and create a life that works for both of us, or will this be a train wreck? What do I do when red flags come up? I think that’s what was most valuable for me as the chapters rolled on — the guidance about how to look objectively at whether this relationship is going to generate more or less over the years. Know it. And not make it personal or let it turn into an indictment of me, them, or even of love. That’s what I’m saying about the sensible tone. The book is blunt. It’s sometimes sarcastic. But the authors use this voice to empower me to see more clearly, less personally, and far less through the rose-colored glasses of love. And that was a gift! The day after finishing the book I woke up grateful to a great boyfriend of the past who told me we were incompatible, when I wanted to keep working on ‘us’ because I loved us. And I thanked him. Truly thanked him. A thank you to my friend Sophie who gave this book to my friend Erica for her birthday at a party where I could flip through it and get intrigued enough to buy it for myself. 🙂 If you read it, and it opens you up, or changes your world, let me know!